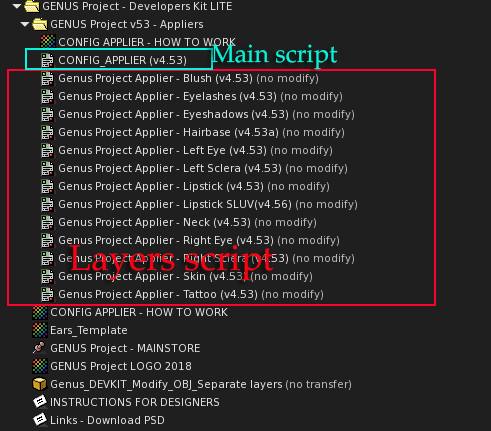 I just got a Genus Mesh head but need help with applying skin UUID's. Get omega relay for genus head and then get omega dev kit to make appliers. In their mainstore u can buy the dev kit for 1L. The omega appliers only works with skins. For the makeups i use only the dev kit, its better and easy to setup. 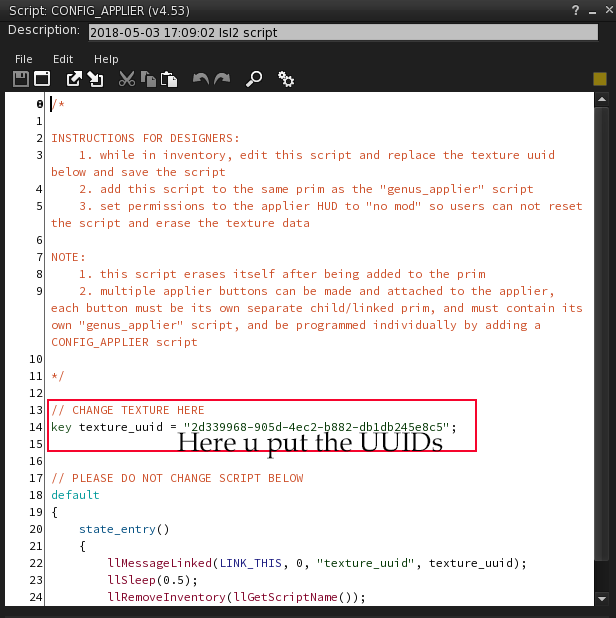 Edit the main script with the UUIDs and put inside on the box. Now u can use the applier! (03-21-2019, 02:29 AM)titubiaz Wrote: Guests cannot see links in the messages. Please register to forum by clicking here to see links. In their mainstore u can buy the dev kit for 1L. The omega appliers only works with skins. For the makeups i use only the dev kit, its better and easy to setup. (03-20-2019, 02:14 PM)Thank you :) pinklemonade Wrote: Guests cannot see links in the messages. Please register to forum by clicking here to see links. Hey,Nukerita use the dev kit for makeups. Rez a box,drop the Lipstick script layer(Not the lipstic Sluv) in that box and change the uuid on main script.